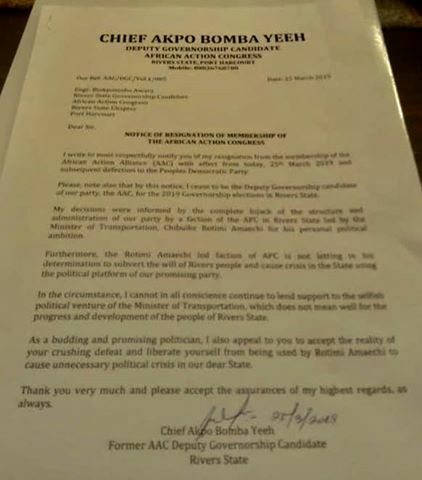 “In the resignation personally signed by Akpo Bombs Yeeh, the Deputy Governorship and addressed to the AAC Governorship candidate, Biokpomabo Awara dated March 25, 2019, said I write to most respectfully notify of my resignation from the membership of the African Action Alliance (AAC) with effect from today 25th March 2019 and subsequent defection to the Peoples Democratic Party (PDP). He said his decision to dump the pursuit of his mandate said by the letter ceases to be the Deputy Governorship Candidate of our Party, the AAC, for the 2019 Governorship Election in Rivers State. Stating further the reason for his critical political decision, Akpo Bomba Yeeh, said “My decisions were informed by the complete hijack of the structure and administration of our Party by a faction of the APC in Rivers State led by the Minister of Transportation, Chibuike Rotimi Amaechi, for his personal political ambition. He also said “Furthermore, the Rotimi Amaechi led faction of the APC is not letting in its determination to subvert the will of Rivers people and cause crisis in the State using the platform of our promising Party. According to him, “In the circumstance, I cannot in all conscience continue to lend support to the selfish political venture of the Minister of Transportation, which does not mean well for the progress and development of the people of Rivers State. The Deputy Governorship further cautioned the AAC Governorship candidate, Biokpomabo Awara, to accept crushing defeat that “As a budding and promising politician, I also appeal to you to accept the reality of your crushing defeat and liberate yourself from being used by Rotimi Amaechi to cause unnecessary political crisis in our dear State”. It is worthy of note that perhaps out rush, the Deputy Governorship candidate could not remember the real name of his party but called it “African Action Alliance (AAA)” in his opening paragraph of his resignation letter instead of “African Action Congress” (AAC). Meanwhile, a human rights activist and some concerned persons led by Omenazu Jackson, staged a peaceful protest to the Department of State Services, DSS, warning that should INEC headquarters refuses to redeploy Mr. Obo Effanga, for alleged bias in any further breakdown of law and order in Rivers state it should be blamed on the national leadership of INEC if it goes ahead in the Collation of the remaining election results.